I’ve joined a new baking group, and I couldn’t be more excited! Gigi and Katie thought it would be fun to actually use the cookbooks they have on the shelves, and so The Cake Slice was born. The premise is easy: we bake from one book per year, making a different recipe each month. This year’s book is a great one, covering a subject dear to my heart–Sky High: Irresistible Triple Layer Cakes by Alicia Huntsman and Peter Wynne. 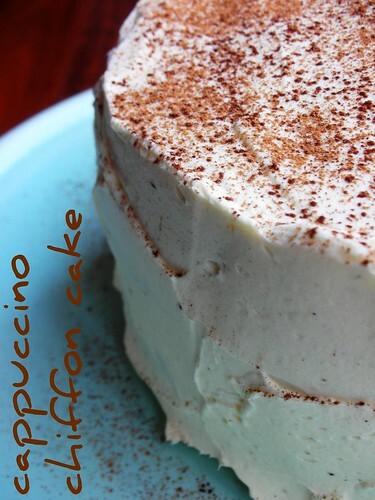 The first of what promises to be twelve amazing layer cakes is a Cappuccino Chiffon Cake. Chiffon cake is light as cloud, and relies on air (in the form of a meringue) to give it a sky-high rise, with a little baking powder mixed in for “insurance” purposes. Because it’s made with oil instead of butter, it’s not incredibly flavorful in and of itself, but its texture makes it a perfect vehicle for soaking up a flavored syrup. 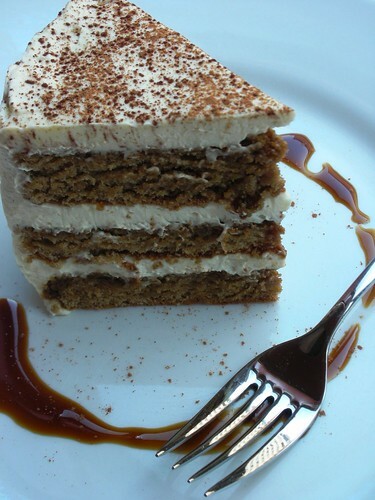 This cake looks and tastes sophisticated, but it’s really quite basic–three layers of espresso-flavored chiffon soaked in a coffee simple syrup, finished off with heaps of whipped cream. Wanting to pack as much cappuccino flavor as I could into the cake, I skipped over to the coffee shop on the corner and bought a few shots of strong espresso to use in the cake batter and the syrup. The only change I made to the recipe was that I switched out the rum in the soaking syrup for Kahlua. I love the lightness of whipped cream frosting, but I have to admit that I’m always a little nervous when actually icing a cake with it. It’s so fragile that messing around with it just a bit too much can overwork it in a hurry. As someone who will muck about with buttercream icing for half an hour trying to get it just so, I had to try hard to just get the whipped cream on there, throw the spatula in the sink and walk away. I wondered how the whipped cream would hold up, but this cake lasted nicely for a couple days in the fridge. It became even tastier as syrup soaked its way through the cake layers. There’s a little cinnamon in the cake batter…I really love it in combination with the espresso. 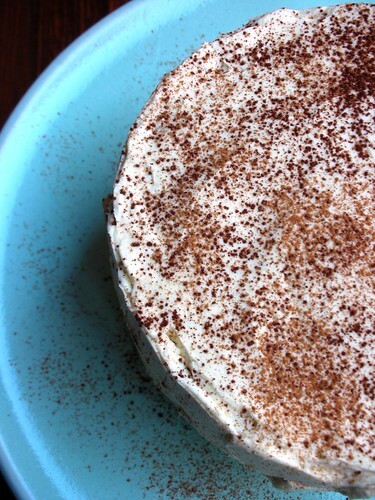 I don’t allow myself to have an afternoon coffee any more (too many sleepless nights), but I’ll make an exception anyday for a slice of cappuccino chiffon cake! Visit Gigi and Katie for the recipe, and cruise through the list of The Cake Slice Bakers to check out all of our chiffon cakes! Don’t be nervous!!! Your frosting skills are impeccable!! Looove the cake. You are such an active blogger 🙂 All those clubs… Just thinking about them makes me kind of stressed! But if all my creations could turn out like this cake, then I would be sold. I fear frosting cakes, and I need to know when to put the mixer down when making them sometimes. I hate curdling my buttercream and that tends to happen to me alot. Also, I forget about using syrups to soak the cake. It’s a nice simple way to add flavor without adding more volume. Great cake, and can’t wait to see more! Your cake looks beautiful! and i love the sound of this group – do you have to own the book to participate? It looks beautiful! I almost made that very same cake yesterday for my anniversary. I ended up making the vanilla buttermilk cake instead. Don’t you just love that book? oh my good this cake looks terrific. I love three layered cakes they got more cake 🙂 I ve always been tempted to try chiffon cakes but so far I ve always been afraid to try it. Maybe i ll try this one its so so tempting. Great job. Amanda–The time deadline of a group seems to be the only way I get anything posted! Tammy–Don’t think you need the book. Gigi and Katie both have posts on their blogs about joing, details, etc. Those were posted sometime in September, if you’re interested in taking a look. It looks beautiful and sounds delicious! One recipe a month sounds doable. I’m going to check out the club! This looks great! I have the book and have been dying to try this cake. I’m going to join the group so I can make them all! Your frosting is beautiful! Your cake looks lovely, but I expected it to! I know how you feel about the whipped cream frosting, but it truly looks great. I always love coming to check out your blog and look forward to our next cake! This was so yummy! I’m passing a nifty blog award to you. Come by my blog to claim it! Jin–Not knowing what you are doing is half the fun! And anyway, after your second or third, you’ll be a pro! Hi Steph, thanks for visiting my site and I do love how your chiffon turned out. Nice pics too! Great job! It really was a good cake for our first post wasn’t it! This is a fantastic cake, light and yummy. I love the photos…my favorite color combo..browns with cream white and robins egg blue. Kahulua is a perfect substitution… good thinking! Your cake looks fantastic. I have to laugh – I stopped drinking coffee in the afternoon as well – but somehow, coffee flavored cake doesn’t bother me!! A wonderful job your cake looks stunning!! Love it…!!! I overworked my whipped cream slightly but it still tasted good. This was definitely a great first cake! Your cake looks great, and your photos are stunning! Your cake looks wonderful and so tall. Would love to try it with the Kahlua syrup. Your cake is just beautiful! Love the color you got on yours! This is such a beautiful cake. You are a natural in the kitchen. Can’t wait to see what everyone else’s looks like. Really gorgeous! I love how yours turned out. the slice is perfect …. Incredible. I’ve seen a few of these today & am very tempted to join the group. Your chiffon is gorgeous! Oh, thanks for letting me know how well the whiped cream lasts. I have to make it the day before and was worried it’d be drippy and ugly by the next!